If three episodes and one comic book wasn't enough Dr.Horrible for you, than perhaps an 8-bit videogame version of the singing supervillain saga will whet your appetite. 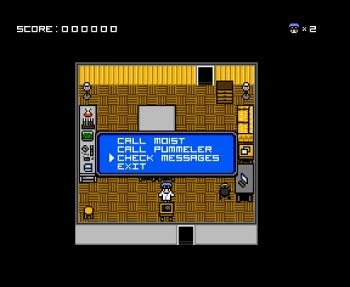 Creator of 8-Bit Jesus, Doctor Octoroc, has converted the first act of the Dr.Horrible series into a faux videogame that would look right at home on an NES. Classified as an RPG, Octoroc compared it to a cross between Final Fantasy and Earthbound. The recreation of Dr.Horrible into pure 8-bit awesome is near-perfect. Various parts of the show are turned into quests. In the first episode, Dr.Horrible must collect the necessary parts to complete construction of his evil freeze ray and remote. For example, the remote is 50% finished and requires a washer motor in order to be completed. Dr.Horrible must go to the Laundromat, procure some tools, and steal the motor in order to complete the remote. It's not an exhaustive recreation of the show; a fair bit of dialogue is left out, but I think it's for the better - some of the dialogue just wouldn't have the same punch without Neil Patrick Harris' voice and perfect delivery. Perhaps the best part is the music - your favorite ditties from the show are converted into the blips and beeps typical of an old-school game. Act One is complete and can be viewed in high quality Flash here. No news on when the next two acts will be completed, but I'm looking forward to seeing how the epic battle between Dr.Horrible and Captain Hammer will be recreated.